Did you see the women’s 1,500m at the Monaco Diamond League meet?! Dibaba set a new WORLD RECORD in 3:50.07 & Shannon Rowbury broke the American record set back in 1983. Amazing. If you missed it, it’s worth a watch. My week of running started at my return to the Marathon Sports Run Club. I missed all of June due to my schedule at work but I’m back! 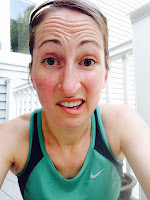 I planned to run easy with friends in the July evening's heat and humidity but I started out with Dave and when he stopped to wait at the turn, I ended up alone and continued on pace to a pretty quick 5 miles. Later in the week the humidity dropped for a few days so I got it two runs with Georgie. She did great! Since then she developed some pretty nasty hotspots on her left hip and is back in the #stupidcone. I also passed my American Red Cross first aid certification test. The final piece to the puzzle to becoming an official certified run coach through the Road Runners Club of America!